Kyle and Amy turned a chance to generate one-time revenue into an opportunity to plan for long-term timber and wildlife habitat production, without sacrificing income in the short term. Last May, Kyle Eastwood married Amy Uthus, a ceramics artist. 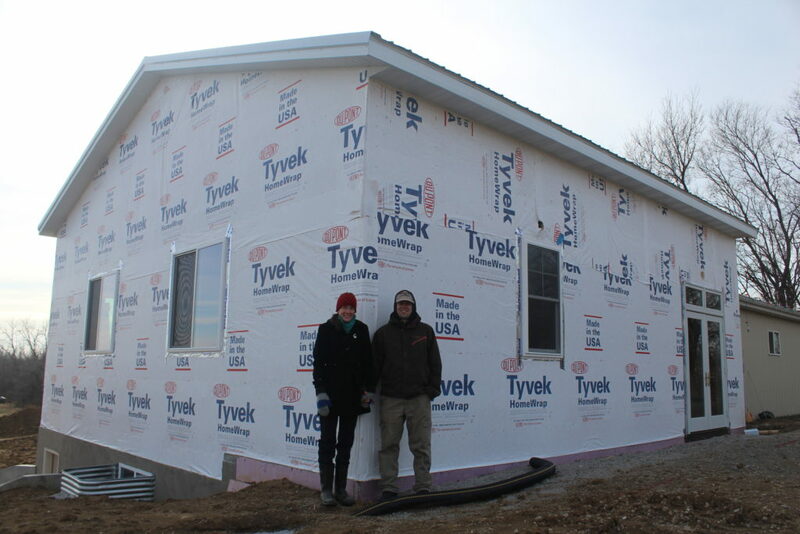 They dreamed of building a studio for her on their 11 acres near Knoxville, and were looking for a way to finance it. Many black walnut trees were growing on the land, and Kyle thought they may provide an opportunity to generate some revenue. He had seen an amish man around town cutting down walnut trees, and asked if he might be interested in making an offer on the black walnuts on his property. 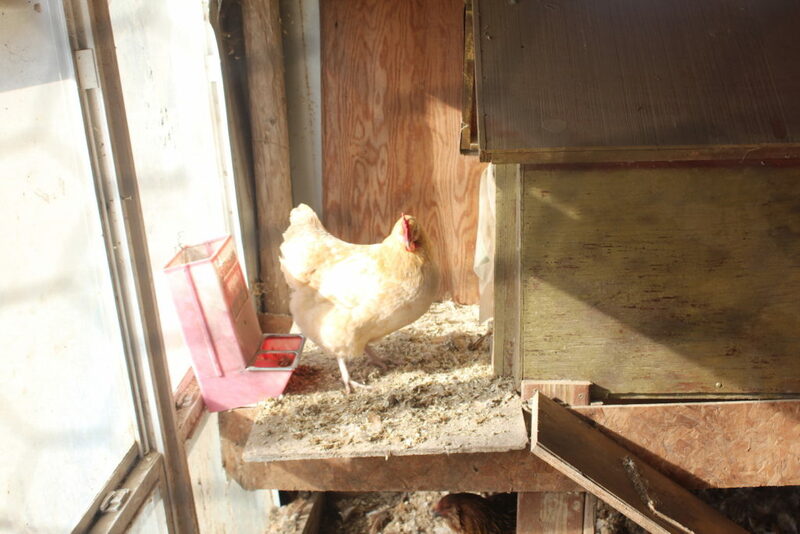 Kyle and Amy’s hens enjoy free ranging outside in the summer, and stay warm in the coop when temps drop. Kyle had purchased the rural acreage a few years ago, after joining the police department in Knoxville. He loved its unique contours and the diversity of landforms, including both forest and pasture, a hill, and a large ditch where a railroad used to run through, for the English Creek Coal Company. 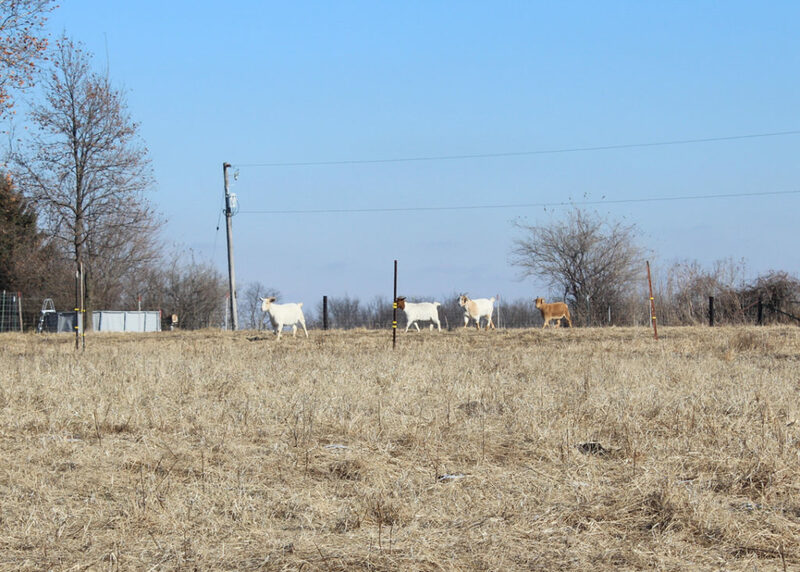 The land provided the opportunity for taking long walks, to raise cows, goats, and a small flock of laying hens, and to plant a fruit and nut orchard. When the man from Knoxville replied with an offer on the black walnuts, Kyle decided to get a second opinion. He was no stranger to trees–a decade ago, he was a forestry classmate of Luke Gran’s at Iowa State University. 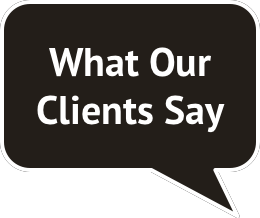 Luke came out to take a look and with their combined forestry knowledge, they considered how to maximize both the short and long-term income generation opportunities from the black walnut resource. 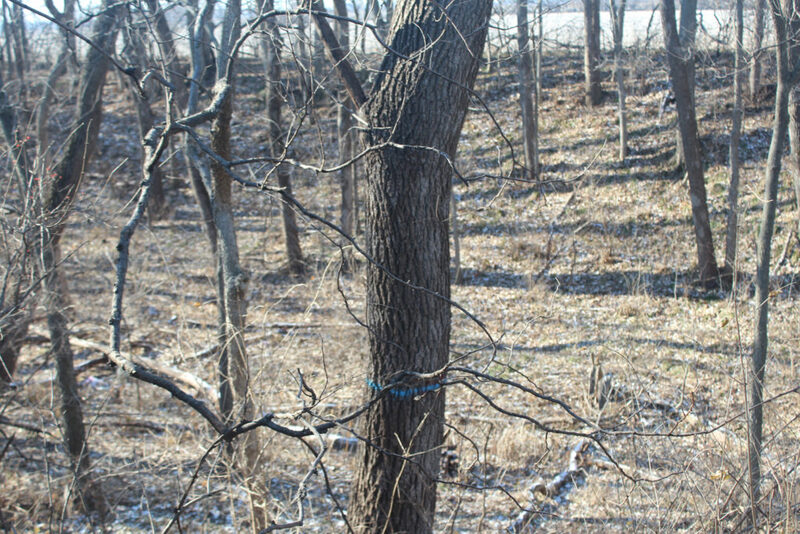 A more poorly formed tree, marked for the first timber sale. Luke recommended that they conduct the timber sale by marking the trees, sending a sale notice to a dozen reputable loggers, and then choosing the best of the competitive bids received. When the bids came in, Kyle and Amy were thrilled to discover that they would be generating more revenue from this sale of only the poorly formed trees that they would have received for all of the trees, had they chosen to accept the original bid from the man in Knoxville. These goats will soon be browsing parts of the woodland to help achieve Kyle and Amy’s ecosystem goals. Beyond the black walnut trees, Kyle and Amy have plans for other components of the woodland ecosystem. Kyle described, “The forest is so dense you can hardly see in it. So many undesirable trees and low brushes–my vision is to have something more open.” He will be removing many of the invasive species in the woodland, and girdling (killing) some of the lower value tree species to promote the health of oaks and other trees that provide excellent habitat for wildlife. 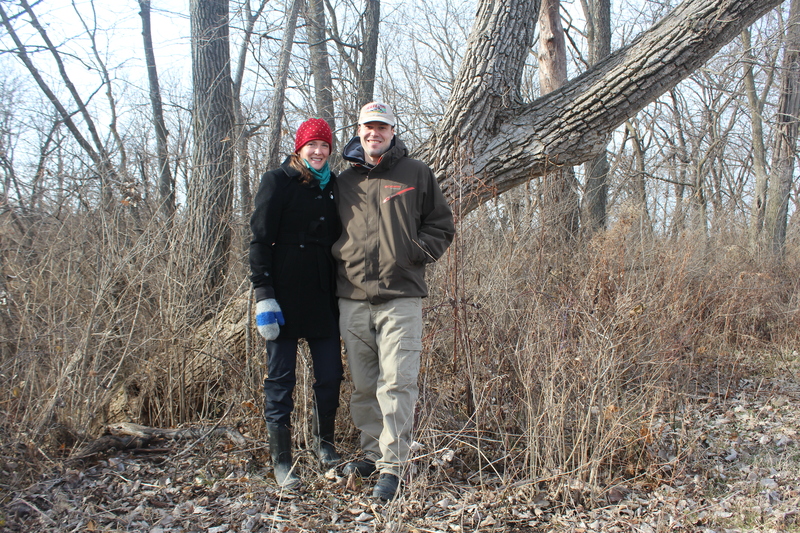 After the timber sale, Kyle and Amy will be working to open up the woodland to make the land more walkable. They will be fencing in the forested land to enable the goats to browse on some of their preferred foods–poison ivy and invasive shrubs. With the strategic integration of livestock throughout their landscape, Kyle and Amy are hoping that the shorter vegetation will lead to a lower population of ticks as well. Made possible by the timber sale, Amy’s ceramics studio is nearly complete. In addition to the handful of fruit trees that were around the house when they purchased it, Kyle and Amy hope to plant cherries and other fruits, as well as edible nuts. They learned some lessons along the way, like the importance of fencing the trees off from the goats so they do not rub off the bark. But they have also experienced the reward of new discoveries, such as, as Kyle described it, “…some of the yummiest peaches I’ve ever eaten”, and learning about new crops, such as hardy Evan’s sweet cherries that were developed in Canada. With the first timber sale underway, Kyle and Amy are already putting the finishing touches on Amy’s new studio, where she can continue to specialize in porcelain and other fine ceramics. Outside the studio walls, in the next decades leading up to their second, larger timber sale, they will be sculpting the landscape to meet their goals for walkability, food production, livestock forage, and wildlife habitat. See Amy’s work at amyuthus.com.